America loves its household appliances. They make life convenient and they’re part of the American Dream. For generations, home appliances have made things more convenient or enjoyable for homeowners and they are among our most beloved possessions. So when you have to put those appliances into storage you want to treat them with TLC. Whether you’re doing a home renovation or planning for an upcoming move, you want to make certain that your appliances come out of storage in the same shape they were when they went in. A good first step is to use A.B. Richards as your storage container company. A.B. Richards is the place to go to rent ground level storage containers throughout the northeast. To store home appliances and to serve other residential storage needs, we recommend our 20ft storage containers. For commercial or industrial storage you might have to go bigger and get our 40ft storage containers or our 40ft Jumbo storage containers with an extra foot of headroom. We’ll deliver the storage containers to where you need them and we’ll pick them up too. We want you to get the most out of your storage and we want to give you some tips on storing appliances. Some of the most difficult items to store are the big ones. For example, you have to do a lot of prep work to store a refrigerator. The San Francisco Chronicle suggests you first empty the food out. You don’t want to be greeted with spoiled goods when you take it out of storage. Make sure the ice-maker is empty and clean the refrigerator thoroughly. When you’re done, tape each shelf in place and put a box of baking soda in each compartment. Wrap the refrigerator in a moving blanket. Cleaning is also critical before storing a washing machine. You should run it empty using a hot water wash cycle, according to the Chronicle. Be careful disconnecting the washer. Turn off the supply valves and the circuit breaker in your home connected to the washer and remove all the hoses. When it’s time to move, clean out all sides of the exterior of the washer and dryer. If you can, reinstall some of the shipping hardware to it. It’s also a good idea to pack the outside of the tub with packing blankets to keep it from moving when you transport it to your storage container. Tape the washer and dryer doors to prevent them from opening. From TVs to computers to kitchen appliances, you should follow some of the same principles you use when storing bigger items. Make certain you clean your items thoroughly before they go into the storage container. Check to see that electrical cords are unplugged, wrapped and placed inside the appliance if possible. If there are any hoses attached they must be removed or taped to the appliance. Be certain to wrap and protect any fragile parts and cover the appliance with a tarp or wrapping blanket. You want to find the most secure and sturdy portable storage unit you can find and A.B. Richards has them. All of our units are made of 14-gauge steel. 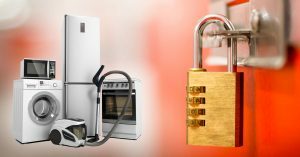 They have two doors that open out so appliances can easily be carried inside and they’re equipped with a sturdy padlock. To get started, contact A.B. Richards today.